If you control a “Photon” or “Galaxy” monster, you can Normal Summon this card without Tributing. If Summoned this way: Target 1 “Galaxy-Eyes Photon Dragon” in your GY (if possible); regardless, this card loses 1000 ATK, and if it does, Special Summon that target (if any) in face-up Defense Position. This ATK decrease lasts until the end of this turn. Galaxy Knight is like Galaxy Trance in monster form, and our Throwback Thursday choice. 2800ATK, Level 8 Normal Summon without tribute AND it doesn’t immediately lose half its ATK? Fantastic. Get a Photon or Galaxy monster on the field (including tokens) and drop this bad boy. Once on the field this way, target a Galaxy-Eyes Photon Dragon in the grave and Special Summon it, then your Knight will lose 1000ATK. If you can’t target a GEPD, your Knight will still lose the 1000ATK, but that leaves him with 2600DEF and 1800ATK, still some good stats. The ATK drop only lasts until the end of the turn, and you likely will already have Xyz or Link Summoned using your Galaxy Knight and Galaxy-Eyes Photon Dragon, and if you are trying to establish board presence, then you’ll have your 2800ATK monster back for next turn. Even by itself this card if a good card. It can be used in any deck that runs even a few Galaxy or Photon monsters, and is good fodder for removal and draw cards. Galaxy Knight is an excellent Throwback Thursday card. He is a Level 8 Light Warrior-type monster with 2800 Atk and 2600 Def. Those are great stats if he’s Normal Summoned. However, he has an alternate Normal Summon if you control any Galaxy or Photon monster including itself. He is summoned in def mode with 1000 less Atk, but the defense stays at a good 2600. If Galaxy-Eyes Photon Dragon is in your grave, you can target it and Special Summon it at the same time in Def position. So you get a free monster from your hand, and if you’re lucky, you get GEPD as well. After the end of the turn, Galaxy Knight gets his 1000 Atk back. An interesting note is that if you have multiple Normal Summons, you can use Galaxy Knight’s effect twice in one turn. Between this and Galaxy Brave, the deck runs a lot of good Level 8s for Trade-in and obviously all the Rank 8 XYZs. I’m thinking maybe 1 Brave, 1 Knight, and I still like 1 Guardian of Order. 3 Galaxy Knight might be too clog, but is still an excellent card for the archetype. Throwback Thursday leads us to one of the first Galaxy monsters that wasn’t Galaxy-Eyes Photon Dragon, Galaxy Knight. Galaxy Knight is a Level 8 LIGHT Warrior with 2800 ATK and 2600 DEF. ATK and DEF are outstanding on a Level 8, along with LIGHT and Warrior. If you control a Photon or Galaxy monster, you can Normal Summon this card without tributing. Nobody wants to tribute two monsters for one, so it’s nice to get Galaxy Knight out on the field with the greatest of ease. If you summon it that way, which is likely the only way it’s getting Normal Summoned, you can target 1 Galaxy-Eyes Photon Dragon in your GY if you have one, regardless of if you do or not Knight loses 1000 ATK until the end of the turn, and you can Special Summon the Galaxy-Eyes Photon Dragon if you targeted one. To be honest, 9 times out of 10 you are only Normal Summoning this if Galaxy-Eyes Photon Dragon is in the GY, which is very easy to get there with cards like Galaxy Solider discarding it, along with the many searchers for it. This means you can immediately summon a Rank 8 monster with the greatest of ease. 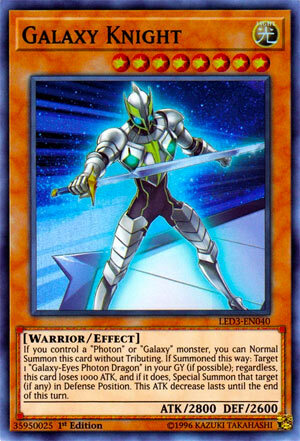 Galaxy Knight is a great card in the archetype and is a must because you will almost always have Galaxy-Eyes Photon Dragon in the GY. Throwback Thursday is Galaxy Knight. A Level 8, Light attributed Warrior, with very solid stats at 2800 attack and 2600 defense. Now, Level 8 is two tributes, however, Galaxy Knight can be Normal Summoned from your Hand without Tribute, if you control a Galaxy or Photon Monster. When you do, you target a Galaxy Eyes Photon Dragon from your Graveyard, and Special Summon it, if possible. If not, then oh well, but regardless (as stated on the card) this card loses 1000 attack, down to 1600. That’s awful, BUT I’m thinking you’d only use this in a situation where you could at least get the Galaxy Eyes, and then the attack drop might not be so much. Plus, he’s still Level 8, so you can XYZ or whatever else you see necessary. Great card here for your XYZ Rank 8 Summons in the Deck obviously, another card to abuse. But, remember too, the 1000 attack decrease only lasts until the End Phase, so he returns to his 2800. He’s a very solid card for a Galaxy/Photon Deck. With such a growing and now, one could argue, overloaded arsenal, I wouldn’t fault a player for not using this. Not to say it isn’t good, because that isn’t true, but lots of these cards will come down to preference. Art: 4.5/5 So what’s he doing…flying, surfing? It almost looks like a walkway he’s on, but the art of space seems to suggest he’s moving, and there is what could be a fin on the back at the bottom…not entirely sure.